Published by Lucina, on 24 marzo 2011 in English Recipes and Meat. 2 Comments Tags: lamb. This is in “memory” of the trip to Morocco Candi and myself went on last year. I love Moroccan food and for Christmas my lovely sons gave me a fabulous proper red tagine pot (see picture). 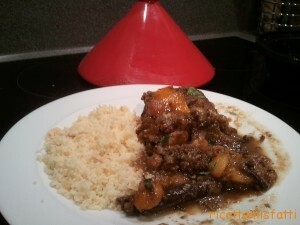 I decided to christen it the other day by making a tagine with lamb. You might be wondering why I keep on using lamb in my recipes. Well…..it’s because I have done a bulk order of organic lamb meat via the same vegetables delivery outfit. But you have to spend a minimum of £25, so I have a few pieces in the freezer. Not that I mind as it’s my favourite meat! My sons also gave me a cookery book (Tagine, spicy stews from Morocco by Ghillie Basan) and it’s in there I found this recipe, which I have slightly adapted. The result is a very moorish , rather sweet dish as it has quite a bit of fruit in it. It is really tasty and it would probably gain by being made in advance and reheated! I served it with some plain cous cous, to which I added flaked toasted almonds. Heat the oil in a tagine or heavy based casserole dish, stir in the almonds and cook until they turn golden. Add the onion and garlic and shallow fry until they begin to colour. Stir in the ginger, saffron, cinnamon sticks and crushed coriander seeds. Toss in the lamb and sautè for 1-2 minutes. Pour in enough water to just cover the meat and bring to the boil. Reduce the heat, cover the tagine or casserole dish and simmer for about an hour or until the meat is tender. Add the prunes, apricots and orange peel, cover and simmer for a further 15-20 minutes. Make sure there is enough liquid in the pot as you want the sauce to be syrupy and slightly caramelized. Sprinkle the chopped coriander leaves on top before serving. Lucina! la ricetta è strepitosa. E porta con sé tutti i ricordi del nostro viaggetto, del corso di cucina e della passeggiata al mercato con Raia. Così mi sono permessa di mettere un piccolo album di quei giorni. Lo trovi in fondo alla pagina a destra. E W Mike & Thomas con i loro regali!